How to draw a Gantt chart for manufacturing process and manage the process visually? Refer to this page to learn manufacturing process with visual and interactive Gantt charts. When it comes to manufacturing process, most people simply consider it as machine producing products. 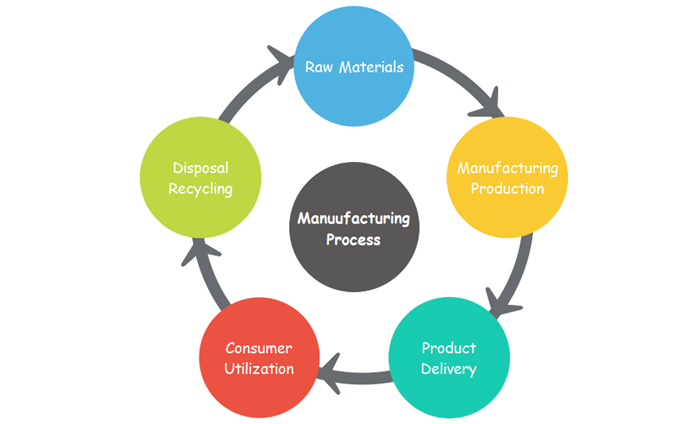 Actually, manufacturing process are the steps that transform raw materials into final products and it has a complete circular chain. Starting from products design, the process also includes purchasing raw materials, modifying the materials into components and final products, packaging and delivering products, after-sales consumer service. Large scale factories will recycle valuable materials for next manufacturing. Why Use Gantt Chart for Manufacturing Process Management? Ensures the effective management of processes and optimized usage of manufacturing resources. Muti-perspective reports help to keep a tight budget and reduce manufacturing costs. Calculates material requirement accurately and prevent material overflow and shortages. Executives can track the manufacturing process and make adjustments promptly to any deviations. Visualize the timeline and present complex task relationships by building task dependency. Use Business Intelligence to analyze, visualize and share important information with stakeholders. Identify the detailed procedures of a product's manufacturing process. Set standard work sequence with a plan for every part. Eliminate design waste through value analysis and real-time communication. Improve functionality and performance of manufacturing machines . Train relevant workers to get familiar with the manufacturing process and equipment. 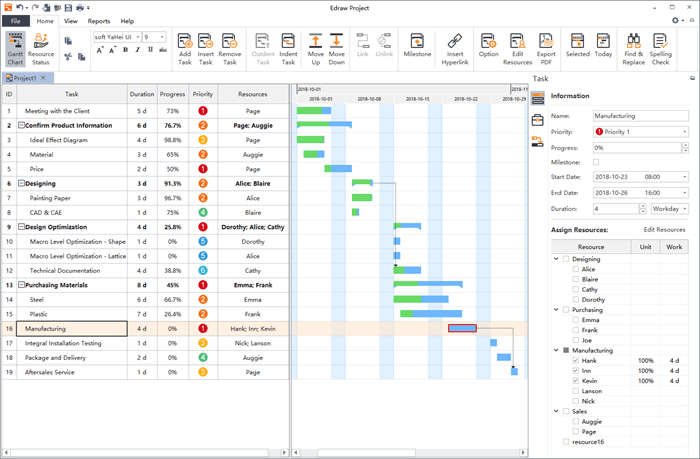 As a professional Gantt chart software, Edraw Project helps schedule and manage manufacturing processes, from meeting crucial deadlines and budgets, to selecting the right resources. It gives an overall picture of manufacturing hierarchy and task reporting relationships, so that managers could gain insight for budget planning and work resources allocation. The Reports options of Edraw Project allows users to generate a variety of reports based on specific perspectives to analyze the project or share with others. The following are some pre-made gantt chart examples made by Edraw Project to inspire beginners in project management. Click on the picture or the text below to download the example for free. You can customize the example to fit your project situation with more advances tools with the easy Gantt chart software. Why Is Gantt Chart Effective for Project Management? Your Professional Project Management Tool! Free Download Edraw Project to Create Visual & Interactive Gantt Charts. Easily schedule, manage, and track your projects in clear reports. Try it Now!